Bubly Flavor Voting Instant-Win and Sweepstakes at Sodexo – Win a trip to Chicago! ENTER SWEEPSTAKES HERE – Bubly Sweepstakes page. ENTRY LIMIT – Limit one (1) Play per day per person/email address/household, regardless of entry method. ELIGIBILITY – Open only to legal residents residing in one of the 50 United States or the District of Columbia who are 18 years of age or older as of the time of participating. SWEEPSTAKES ENTRY PERIOD – The Promotion begins on January 5, 2019 at 12:00:00 p.m. Eastern Time (“ET”) and ends on May 31, 2019 at 11:59:59 p.m. ET. responsibility of winner and guests. Winner and travel guests must travel on same itinerary. Travel guests must be 18 years of age or older (19 in AL or NE) to accompany the winner on all prize-related travel and events. Sponsor assumes no responsibility for cancelled, delayed, suspended or rescheduled air transportation, ground transportation or events beyond its control, and all prize details are subject to availability. Winner and travel guests must sign and return travel releases and any prize-related documents before any ticketing or travel occurs. Winner and guests must have all necessary identification and/or travel documents (e.g. a valid U.S. driver’s license) required for travel within the United States. Winner and guests must abide by all prize-related requirements and instructions. Winner understands that there are inherent risks involved in travel and prizing activities and that these risks may be present before, during and after the trip. Approximate Retail Value (“ARV”) of the Grand Prize is $5,800.00. The actual retail value of the Grand Prize may vary. If the actual value is less than the ARV of $5,800.00, the difference will not be awarded to the winner. Any portion of any prize not accepted or used by the winner will be forfeited. Instant-Win Prizes – Awarded via the Instant-Win Game. Period 1: Each winner will receive a Fitbit Versa Smart Watch – Peach Color. ARV: $255.00 each. Period 1: Each winner will receive a JBL Clip 3 – Fiesta Red Color. ARV: $50.00 each. Period 1: Each winner will receive a JBL Clip 3 – Dusty Pink Color. ARV: $50.00 each. Each winner will receive a Fitbit Versa Smart Watch – Mint Color. ARV: $255.00 each. 2: Each winner will receive a JBL Clip 3 – Mustard Yellow Color. ARV: $50.00 each. Each winner will receive a JBL Clip 3 – River Teal Color. ARV: $50.00 each. address/household. An Instant-Win Prize winner is eligible to win the Grand Prize. WINNER’S LIST – To request the names of the winners, send a self-addressed, stamped envelope to: Bubly Flavor Voting Instant Win and Sweepstakes at Sodexo, 10 South 5th Street, 7th Floor, Dept. 888-7094, Minneapolis, MN 55402. Requests must be received by July 1, 2019. True Lemon Be Healthy. Be Happy. Be True. Sweepstakes – Win $10,000 & more! Win $10,000, a Vitamix & more! ENTER SWEEPSTAKES HERE – True Lemon Sweepstakes page. ENTRY LIMIT – Limit one (1) Primary Entry per person, per email address during the Promotion Period. ELIGIBILITY – Be Healthy. Be Happy. Be True Sweepstakes is open only to legal residents of the fifty (50) United States and the District of Columbia who are eighteen (18) years of age or older at the time of entry. Earn bonus entries by completing social media tasks and sharing the sweepstakes (2 bonus entries per friend who enters using your unique link). SWEEPSTAKES ENTRY PERIOD – The Sweepstakes begins on or about April 1, 2018, at 12:00:00 AM Eastern Daylight Savings Time (“EDT”) and ends on June 15, 2018, at 11:59:59 PM. EDT. PRIZES – ONE (1) GRAND PRIZE: Grand Prize winner will receive the following: (i) one cash prize in the amount of $10,000 in the form of a check made payable to the Grand Prize Winner’s; (ii) One (1) Vitamix Professional Series (ARV: $600); (iii) one (1) Fitbit Iconic Watch (ARV: $270); (iv) One (1) Be Happy. Be Healthy. 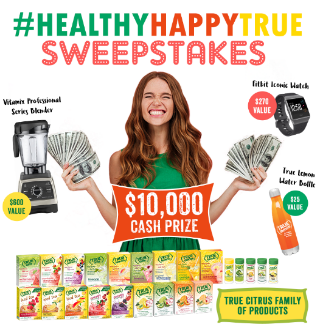 Be True Water Bottle (ARV: $25) and; (v) One assortment supply of True Citrus products (ARV:$100); (i, ii, iii, iv, and v collectively “Grand Prize”). The total ARV of Grand Prize: $10,995. FIVE (5) SECOND PRIZES: Five (5) Second Prize Winners will each receive one (1) two hundred and fifty dollars ($250) gift card; one (1) Fitbit Flex 2 (ARV: $60), one (1) Be Happy. Be Healthy. Be True Water bottle (ARV: $25) and one (1) assortment supply of True Citrus products (ARV: $100); the total ARV for each Second Prize: $435. 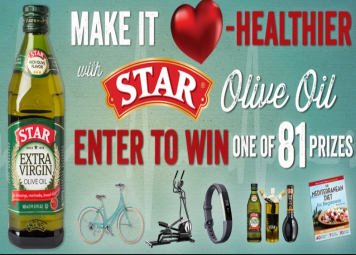 STAR Fine Foods Heart Healthy Sweepstakes – Win a PUBLIC Bike! Win a PUBLIC bike or a ProForm Elliptical! ENTER SWEEPSTAKES HERE – Star Fine Foods Sweepstakes page. ENTRY LIMIT – Limit one (1) Entry per individual person/email address per day during the Sweepstakes Period. ELIGIBILITY – Open to legal residents of the 50 United States and the District of Columbia, 18 years of age or older as of date of entry. SWEEPSTAKES ENTRY PERIOD – STAR Fine Foods Heart Healthy Sweepstakes begins February 6, 2018 at 10:00 a.m. Pacific Standard Time (“PST”) and ends March 4, 2018 at 11:59 p.m. PST. 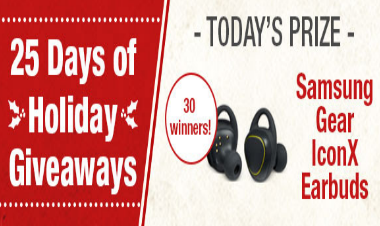 PRIZES – (81 winners total): One (1) PUBLIC V1 or C1 Bike (ARV: $399) OR One (1) ProForm 150i Elliptical (ARV: $320), five (5) Fitbit Alta HR Fitness Trackers (ARV: $120), twenty-five (25) STAR Extra Virgin Olive Oil, Vinegar and Cruet Sets (ARV: $17), fifty (50) The Mediterranean Diet for Beginners – Paperback Edition (ARV: $7.16). 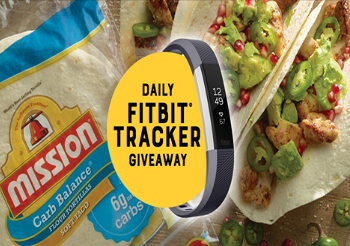 Mission Foods “MISSION TO CHANGE” Sweepstakes – Win a Fitbit Tracker! Win a Fitbit Alta™ HR Fitness Tracker Wristband (31 winners)! ENTER SWEEPSTAKES HERE – Mission Sweepstakes page. ENTRY LIMIT – Entry Limit: one (1) entry per person and per day regardless of method of entry. For purposes of these Official Rules, a “day” is defined as a calendar day in ET. ELIGIBILITY – Open to legal residents of one of the 50 states of the United States or the District of Columbia who are age of majority (age 19 in Alabama & Nebraska, age 21 in Mississippi and age 18 in all other states and D.C.) or older. SWEEPSTAKES ENTRY PERIOD – The Mission Foods “MISSION TO CHANGE” Sweepstakes begins at 12:00:01 a.m. Eastern Time (“ET)” on January 1, 2018 and ends 11:59:59 p.m. ET on January 31, 2018. PRIZES – Thirty One (31) Prizes: each, a Fitbit Alta™ HR Fitness Tracker Wristbands. Approximate retail value (“ARV”): $149.95 each. Total ARV of all prizes: $4,648.85. Vitacost.com “25 Day Giveaway” Sweepstakes – Win daily prizes! Win daily prizes (prizes include: Go Pro Hero Session, Diamondback bike, Fitbit Flex, Nutri Bullet and other daily prizes)! ENTER SWEEPSTAKES HERE – Vitacost Sweepstakes page. ENTRY LIMIT – Limit one entry per day. ELIGIBILITY – The Vitacost.com “25 Day Giveaway” is offered only to legal residents of the forty-eight contiguous United States and the District of Columbia (“U.S.”) who are at least eighteen years old at time of participation and who currently reside in the U.S. SWEEPSTAKES ENTRY PERIOD – Promotion starts on or about 12:00 am Eastern Time (“ET”) on or about November 22, 2016 and ends 11:59 pm ET on December 16, 2016. Limit one (1) prize per person/household during the entire Promotion Period. 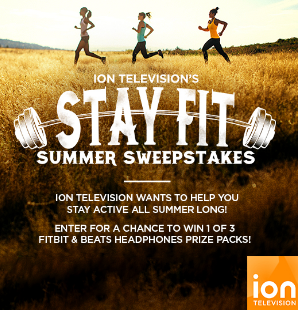 ION Television’s “Stay Fit Summer” Sweepstakes – Win a Fitbit & more! Win 1 of 3 ION Prize Packs, each one including a Fitbit, Beats Headphones, yoga mat, and water bottle! ENTER SWEEPSTAKES HERE – ION Television Sweepstakes page. ENTRY LIMIT – Limit one registration entry – earn more entries by completing social media activities. ELIGIBILITY – The Sweepstakes is open to legal residents that physically reside in the fifty (50) U.S. or the District of Columbia and are the legal age of majority in the jurisdiction in which they reside (and at least eighteen (18) years old) as of date of entry. SWEEPSTAKES ENTRY PERIOD – ION Television’s “Stay Fit Summer Sweepstakes” starts on July 21, 2016 at 10:00 a.m. Eastern Time (“ET”) and ends on July 31, 2016 at 11:59 p.m. ET. PRIZES – win 1 of 3 ION Prize Packs, each one including a Fitbit, Beats Headphones, yoga mat, and water bottle! Culturelle “The Healthiest You Ever” Sweepstakes & IWG – Win a trip to Red Mountain Resort in Utah! Win a trip to Red Mountain Resort in Utah! ENTER SWEEPSTAKES HERE – Culturelle Sweepstakes page. ENTRY LIMIT – Limit one (1) registration per person/e-mail address. 2.) You may earn an additional Sweepstakes entry each time you complete one (1) of the twenty-five (25) Sponsor-specified Instant Win Activities (each an “Activity”) for the chance to win an Instant Win Prize as detailed below. Limit twenty-six (26) total entries per person/email address throughout the Promotion Period. ELIGIBILITY – The Sweepstakes and Instant Win are open to legal residents of the 50 United States and D.C., who are 18 years of age or older as of date of registration. begins 12:00:00 AM Eastern Time (“ET”) on June 9, 2016 and ends 11:59:59 PM ET on October 31, 2016.
nearest the winner’s round trip home to the Ivins, Utah area, four (4) nights’ accommodations at the resort (based on double occupancy), a $200 travel stipend, awarded as a Sponsor-specified gift card, and Sponsor-specified spa services. The ARV of the Trip is $5,500. Fifty (50) Sponsor-specified Yoga Mats (ARV: $10 each), Odds 1:2,000. 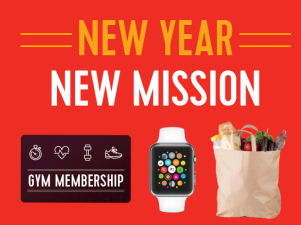 Mission® New Year, New Mission Sweepstakes – Win an Apple Watch & more! Win a one year gym membership, $1,000 in groceries and an Apple Watch (14 winners)! ENTRY LIMIT – Limit one entry per person/email address/phone number during the Entry Period regardless of method of entry. ELIGIBILITY – Sweepstakes is open only to legal residents of the 50 United States and D.C., who are 18 years of age or older at the time of entry. SWEEPSTAKES ENTRY PERIOD – This Sweepstakes begins at 12:00:01 a.m. ET on January 1, 2016 and ends at 11:59:59 p.m. ET on February 1, 2016. PRIZES – Fourteen (14) Grand Prizes: A one year membership to a gym of winner’s choice (up to maximum value of $1,000 for membership), plus $1,000 in groceries, plus one (1) Apple Watch® (approximate retail value “ARV” of watch $500). Gym membership and groceries will be awarded in the form of a check for $2,000, which the winner can use to pay for the membership and groceries or for any other purpose. ARV of each Grand Prize: $2,500. Ten (10) First Prizes: an Apple Watch®. ARV of each First Prize: $500. Forty (40) Second Prizes: a Fitbit®. ARV of each Second Prize: $150. 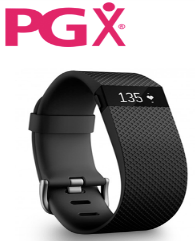 PGX Fitbit® Charge HR Giveaway Contest – Win a Fitbit Charge HR! Win a Fitbit Charge HR Wireless Heart Rate + Activity Wristband (13 winners)! ENTER SWEEPSTAKES HERE – PGX Sweepstakes page. ENTRY LIMIT – A maximum of one (1) entry per person per day may be submitted. ELIGIBILITY – This Contest is open to all persons residing in all of the provinces and territories of Canada and all of the states in the United States of America (except residents of Florida, New York and Rhode Island, where the Contest is void), who have reached the age of majority in their state, province, or territory of residence as of the first day of the Contest Period. SWEEPSTAKES ENTRY PERIOD – The Contest closes at 11:59:59 pm Eastern Time (“ET”) on March 31, 2016. PRIZES – One (1) Prize will be awarded each week of the Contest Period for a total of thirteen (13) Prizes available to be won. One (1) Fitbit Charge HR™ Wireless Heart Rate + Activity Wristband. 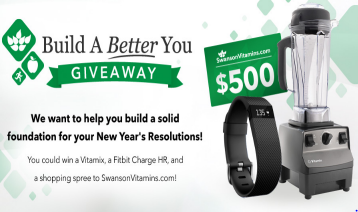 Swansons Vitamins Build a Better You Sweepstakes – Win a Vitamix & more! Win a Vitamix, a Fitbit and a $500 shopping spree at Swansons Vitamins! ENTER SWEEPSTAKES HERE – Swansons Vitamins Sweepstakes page. ENTRY LIMIT – Earn up to 8 entries by performing social media tasks. Earn bonus entries by sharing with friends. ELIGIBILITY – To be eligible for Prizes in the Sweepstakes, you must, at the time of entry, be 1) a legal resident of the 50 United States or the District of Columbia, 2) physically located in the 50 United States or the District of Columbia, and 3) 18 years of age or older. SWEEPSTAKES ENTRY PERIOD – The Sweepstakes begins at 12:01 a.m. Central Time (CT) on January 1, 2016 and ends at 11:59 p.m. Central Time (CT) on January 31, 2016. All Sweepstakes Entries (as defined below) must be received by 11:59 p.m. CT on January 31, 2016. PRIZES – One (1) Winner will be drawn at random from among eligible entries received by 11:59 p.m. CT, January 31, 2016. Grand Prize: One (1) Vitamix® Professional Series 200 Blender, one (1) Fitbit® Charge HR™ Heart Rate and Activity Wristband, and $500.00 in coupon codes for use on swansonvitamins.com. Approximate retail value (ARV): $1128.95. First Prize (1): $250.00 in coupon codes for use on swansonvitamins.com. (ARV: $250). Second Prize (1): $100.00 in coupon codes for use on swansonvitamins.com. (ARV: $100).